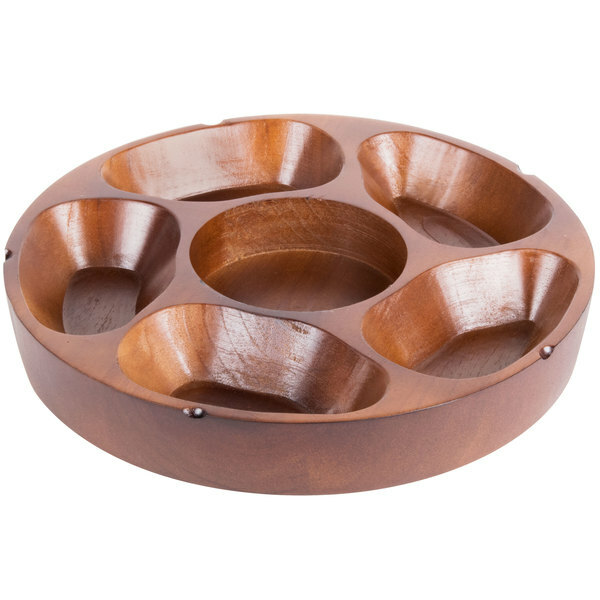 Be a trendsetter with this classy, carved wooden Town Pu Pu / appetizer platter with 6 compartments! Ideal for American Chinese restaurants, Polynesian restaurants, and tiki bars, Pu Pu platters were designed as an innovative way to present a variety of assorted meats and seafood appetizers on one platter. 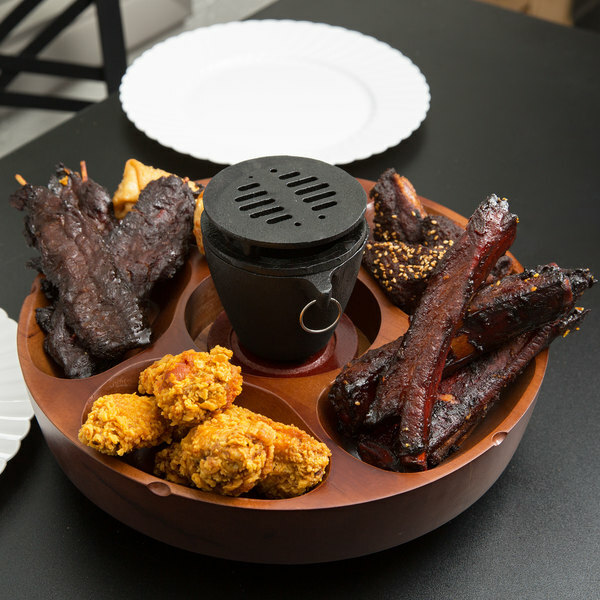 Ideal for serving delicious finger foods while customers enjoy your craft cocktails, this Pu Pu platter includes 6 compartments and a convenient, revolving "Lazy Susan" design that allows the platter to rotate on its base for a piece that is as functional as it is stylish. 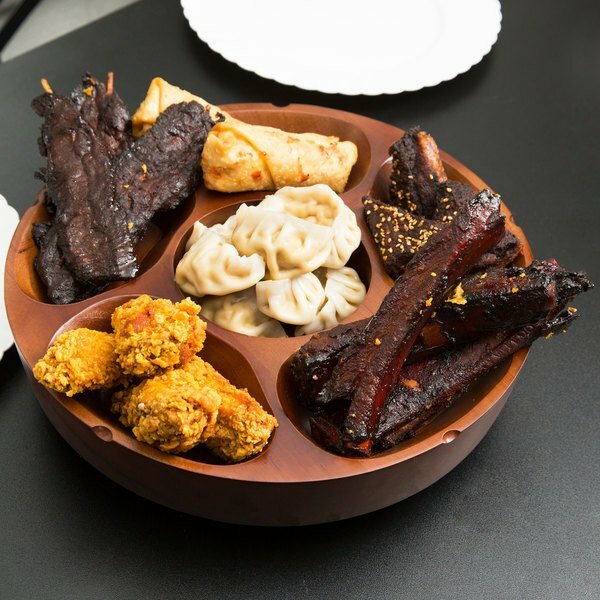 Wow your guests and elevate your appetizers' potential to the next level with this Pu Pu platter! "Your guests will love this! 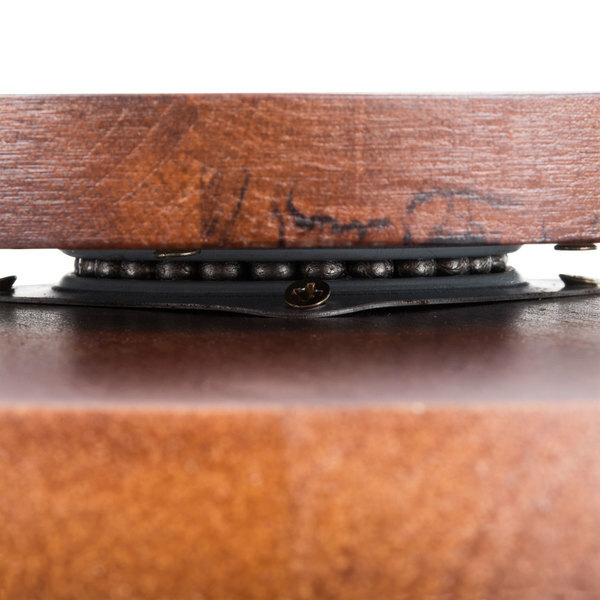 Both attractive and functional, this platter rotates on its base and has room in the center for a hibachi or sauce." With five separate compartments around the edge in addition to the center compartment, this platter allows your guests to customize their order with various appetizers like egg rolls, beef teriyaki skewers, chicken wings, crab rangoon, along with different sauces. The center compartment can also be used for a hibachi set (sold separately), allowing your guests to reheat items as needed for an enhanced dining experience. 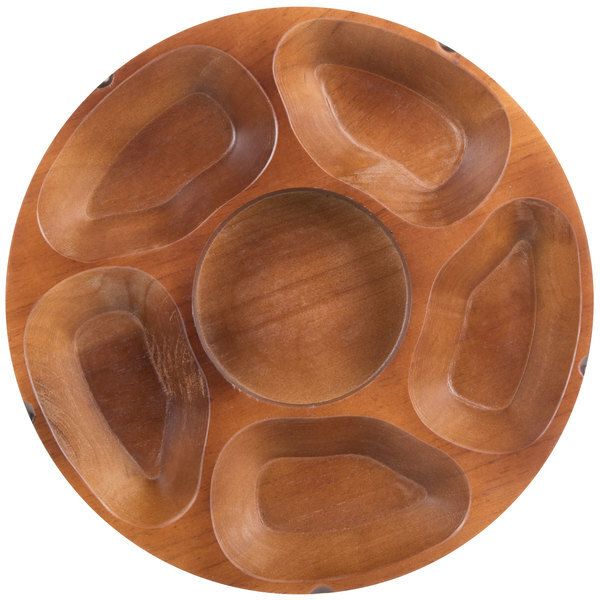 Featuring a carved, wooden construction, this Pu Pu platter offers a natural, attractive look that is sure to elevate your restaurant's ambiance while providing long-lasting durability in your commercial environment. 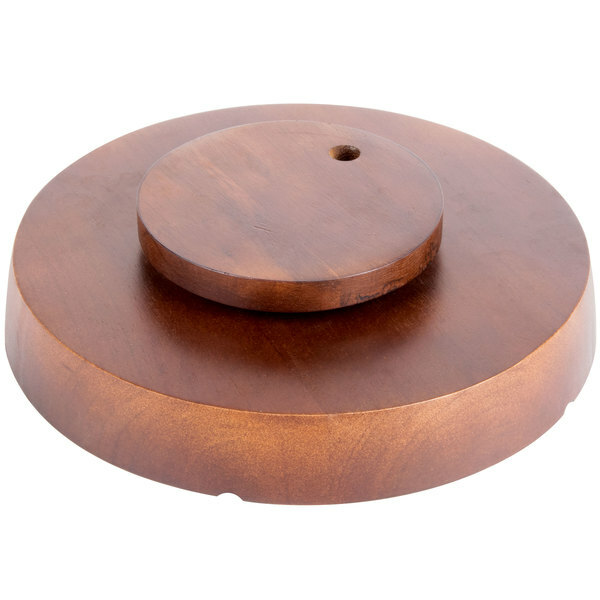 This platter's convenient "Lazy Susan" design makes it capable of spinning on the tabletop, so each side is easily accessible for everyone at the table. This is a great feature to have when serving appetizer and samplers, and eliminates guests needing to reach across the table. While typically used for Chinese American appetizers, there is no one way to use this Pu Pu platter! Serve a combination of skewered, fried, and saucy foods together at your bar, serve a classic veggie and hummus platter at your catered event, or use as a unique way to serve chips and salsa at your Mexican restaurant. Sir Clean recommended this product 5 Compartment Carved Wooden Pu Pu Platter 12" Diameter, perfect to use in parties, events. The material of the platter is really good. Perfect complemetn for the hibachi grills, easy to organize all dipps and assortment. Customers give us completements all the time and they too find it very enjoying! This is the perfect dish for a dinner party at your house. You can put different appetizers and theres a spot for the dip as well. Your guests will love this! 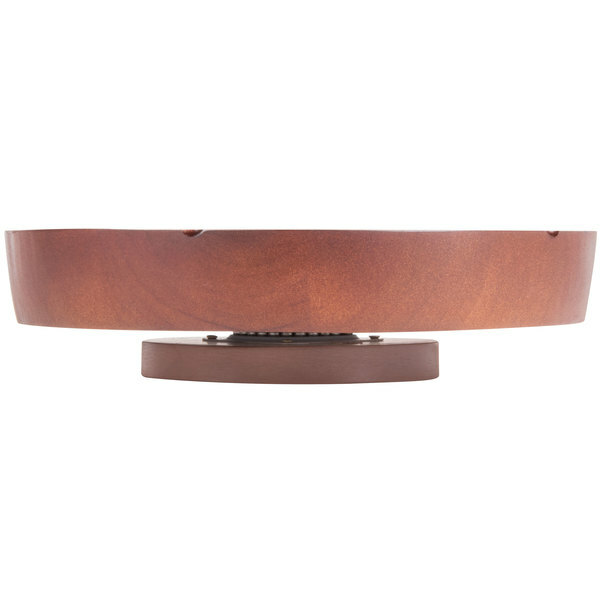 Both attractive and functional, this platter rotates on its base and has room in the center for a hibachi or sauce. This is a nice item for holding house and dinner parties! It is great for offering vegetables and dip or even chips and salsa! Wooden material makes it unique!! These are so unique and hold up so great!!! really fit the at home style that we offer and as a bonus easy to clean!! 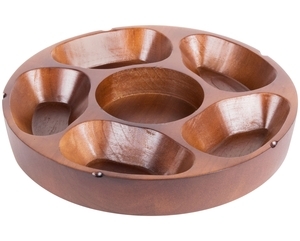 Great for entertaining, either you use it with the available grill or not, it works for small sides, condiments, etc.It is made of very nice wood.